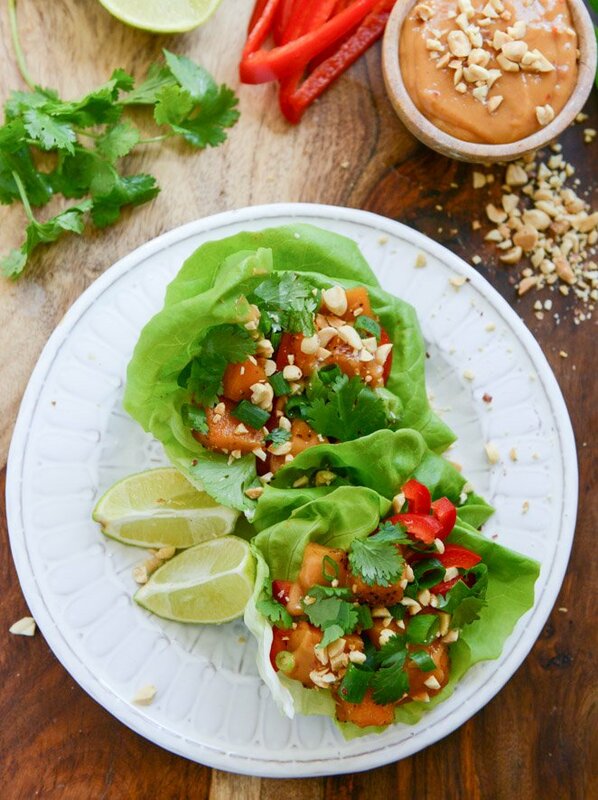 Thai Butternut Squash Lettuce Wraps. This is it. For now. Until my next new favorite thing comes along. Until I binge on enough butternut squash to be completely sick of it come December. Until I eat this same thing five days in a row because it tastes so delicious until it… doesn’t. It’s like I have palate ADD. Many times I never know what I’m craving and what I really want to eat until the exact moment that I want to eat it. Especially around lunchtime. SO them I’m left with like twenty minutes to get my act together and come up with something that will make my high-maintenance foodself happy. You know you know you know? If it was up to me I’d probably eat breakfast, grilled cheeseseseses, pizza and burgers for lunch everyday. I mean it is up to me but instead of eating like an jerkhead teenager I try to be an adult annnnnnd not give myself a myocardial infarction. I know that I probably don’t come to mind when you think LETTUCE wraps, but my dirty little secret is that I love them. Because my other dirty little secret is that I love iceberg lettuce in all it’s crisp, fresh, nutrientless glory. It’s just so darn refreshing. And the only lettuce I like better than iceberg is butter lettuce. I freaking love butter lettuce. Shout it from the rooftops! It’s probably no coincidence that it’s called butter lettuce. If I can find a beautiful head of butter lettuce, it’s my number one choice for wraps. As you can guess, it all comes back to a texture thing. Being a leeeettle nervous about how the texture of these wraps would stand up to my high demands due to the uncrisp nature of squash, I added some fresh red pepper strips and lots of crunchy peanuts. I can totally handle the vegetables in this state. I also caramelized the squash again (of course, because apparently I can’t eat it any other way this season) with some chili powder and brown sugar. Man, I may just start eating that on the regular. So awesome. And I’m not too sure what my fascination is with squash and Thai-like flavors, other than it just plain out works and appeals to my taste buds. That’s how I cook here… stuff that I like. I can’t keep any secrets from you. Plus… more room for treats. I’m recently obsessed with thai food. This is such a healthy spin on it! Totally agree with your more room for treats sentiment. Mwahaha! These need to appear in my body RIGHT NOW! Love! But I bet these would pass the test! Yum! I hear you sister. I went though a phase of only eating corn with every meal for about a month. Right now I am in love with salads, this look like it would be right up my alley; spicy, sweet and above all quick! OMG this is genius! I’ve never thought to Thai-up my butternut squash but now I have to try it. Pinned! Yum! What a fun and great idea! I just love butternut squash it is one of my Fall favorite dishes! Yum! Awesome recipe Jessica! Love these. So awesome and so many flavors I am crazy for right now! I just make a risotto with ver similar flavors, so I already know these are going to be awesome! I am completely obsessing with butternut squash… so much so I joined a challenge to make 3 meals with it..;) Love this! yessss sorry! just a typo. I noticed in the directions it says “top it with the chicken…” but nowhere in the ingredients does it talk about chicken. Is there supposed to be chicken in the wraps? Either way, butternut plus thai flavors: what a cool combo! haha no, i had a major brain screw up writing the recipe! I caramelized butternut squash for the first time last night with some brown sugar. I am HOOKED! These wraps look wonderful, especially the crunchy peanuts. And butter lettuce – yes! Always butter lettuce. i have been overdosing on butternut squash lately as well..these wraps look so good esp that lettuce. Can you roast butternut squash just like spaghetti squash? not quite sure what you mean – do you mean can you slice it down center and roast it? Yes, I’m like this, but even more so now that I’m pregnant. It’s like 10X worse. Sometimes I don’t even know what I want while I am eating the thing I thought I wanted, but don’t. It’s a tough life. YUM! Lettuce wraps are always a great choice but these are so different and look great! These look soooo good! I love me some butternut squash, and especially with chili powder type flavors. These seem like a great break from the excess of the holidays that is already starting around here. It might be a little bold to say I Love You but I’m pretty sure this recipe warrants it. Lettuce wraps = zero calories = eat 20 of them= happy/no regret. well, this looks amazing. i have been eating squash non-stop…love this idea. also, I am a huge lettuce wrap fan. I feel like I can eat a ton of them and they’ll always be “healthy.” :). I totally know what you mean. I am on a serious pomegranate kick right now! I have been in the same boat the with the b-nut. I feel like everything I’ve been posting so far has centered around squash, apples, and other fallish things. But b-nut is my absolute fav. Dare I say….I like it more than pumpkin. Wow! These look amazing! I was just demanding thai chiken lettuce wraps to a protesting hubby, but since I have butternut squash in my husband has no reason to denie me now!! YAY! You’re the bestest! I want to pour the thai dipping/drizzling sauce on everything! Sweet chili, brown sugar, coconut milk, PB….that is my dream sauce! Beautiful wraps! Butter lettuce is so dreamy! Mmm, butternut squash sauteed is the best thing ever. Caramelized sounds amazing. I make ALL of your Thai recipes!!! Just one more to put on my list! Looks wonderful! I need to make that dipping suace–I kind of want to eat it on everything. And now my bowl of soup for lunch seems very, very sad indeed. The colors in this! The flavors! Need and want. Your photography looks incredible, yum! These look so freaking good! I think I’ve eaten butternut squash every day during the month of October… probably turning a little orange around the edges. This looks like an awesome way to dress it up – love those Thai flavors! My college roommate introduced me to butter lettuce and I can never go back. Ever. It;s so silkyyyyy. Total winner. I’m the same- I’m suddenly starving at 1pm and have to eat FAST or I get all hangry and just have Pringles for lunch. Which means i’ll be buying butter lettuce sometime this week and making me some wraps, I think! These wraps look delicious! I love Thai food and I just recently discovered the deliciousness of butternut squash (late to the party I know). There is this aquaponics place in my hometown that grows the most delicious butter lettuce ever! My absolute favorite lettuce! awesome recipe.. i love butternut squash ,obsessed with all things coconut and im trying NOT to eat gluten (cause it hurts me), so this is a great recipe to have in my recipe box. I NEED to try this caramelized squash business! You made healthy food look tempting! I praise you! How are you always in my head? My butternut squash, peanut butter, anythingThai, bacon, bourbon,chocolate and avocado obsessions are out of hand. You have just combined half of them in one happy happy dish. You are my invisible internet soul sister! Ok, I am really craving this right now! Damn girl, you’ve got STYLE. Whoa! I LOVE butternut squash AND anything Thai. So perfect. OMG…made these tonight ans they were so good. I made them with roasted shredded chicken …because the husband has to have meat! They are amazing!!! Made the squash/sauce tonight, and just served over rice with Asian meatballs. Delicious!! Not sure if I screwed up the sauce somehow, but it ended up being very runny. The picture looked a little thicker and peanut buttery than what I concocted, so I added peanut butter total about 2 tbsp. Regardless…this is officially added to my fall squash repertoire! Thanks for sharing. I made these last night, and they were fantastic! Next time, I’ll use more squash (2 cups only made enough for my me and my bf). Also, the sauce I made turned out runny like Jennifer’s. Next time I’ll try adding more peanut butter to thicken it up. Thanks for the healthy recipe with such great flavors!